Abrigo en paño poliéster color rosa lychee con mezcla de cortes y texturas, cierre con botones metálicos pintados, forro en acetato ultra respirable. Chaqueta corta en paño liviano, corte asimétrco, sin forro y prendedor en forma de corazon. Abrigo en lona poliéster estampada, mangas en tejido de punto con coderas en microfibra, cuello alto, cierre metálico. Beige coat in polyester fabric, mix of textures, high neck, metallic closure. Cloth short jacket, knitedd sleeves, high neck, front and rear buttons. 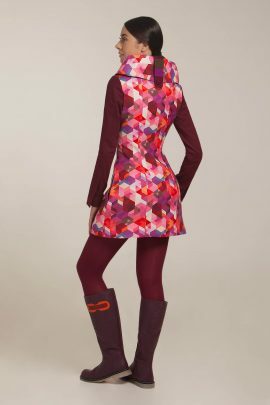 Cloth coat, A silhouette, high neck, frontal ornament in microfiber colors, metallic closure. Printed dark grey cotton Jacket, knitedd sleeves, microfiber sleeves, elbow pads in microfiber, metallic closure. 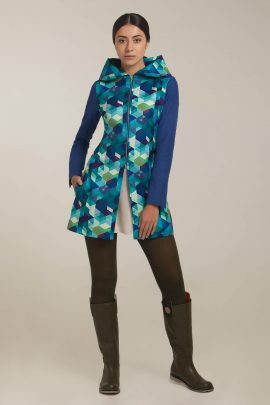 Polyester and cotton coat, printed in blue tones, cotton sleeves, high neck, metallic closure.. Printed canvas short Jacket, wide silhouette, 3/4 sleeves, military style neck, front closure with buttons. 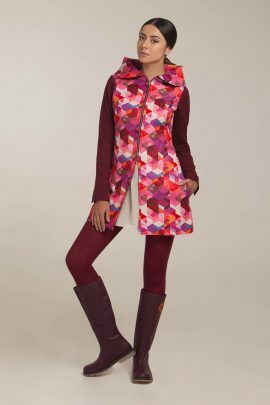 Polyester and cotton coat, printed in red tones, cotton sleeves, high neck, metallic closure. Cloth vest eggplant color with knitted hood scarf style, pockets with ornaments.